Did y'all know Reading Eggs has "stuff" for kids up to around age 13?! I HAD NO IDEA! Talk about SUPER excited when I found out about this little handy piece of information! So for the past few weeks Mr. B has been having a blast using Reading Eggspress, while Princess J has been having a ball with Reading Eggs Junior. There are a few different levels offered. 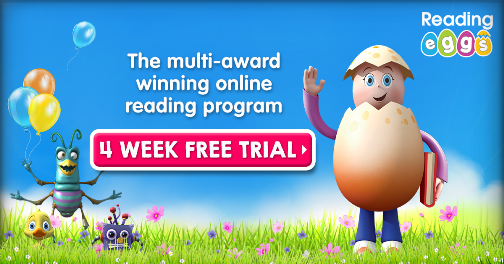 Reading Eggs Junior is intended for ages 2-4, Reading Eggs for ages 3-7, Reading Eggspress for ages 7-13, and Mathseeds for ages 3-9. As always, age ranges are subjective and as special needs parents we sometimes have to ignore the age range and look at the overall ability of our child. Well, first things first: I messed up haha! I thought I knew right where my son needed to be. Princess was easy. She's 4, and doesn't read yet, so the first level was right where she needed to be. She does know her ABCs, and a lot of the sounds they make-so the placement test would have placed her higher than the first level. But, I wanted to start her out on levels where I KNEW she could 100% succeed to make it fun for her, and not overly challenging. Special needs require us to tailor things at times, and this is one thing I did for Princess J. So for Mr. B, I just started him on the level I thought was correct. I tried the placement test first, but for some reason I wasn't figuring out how to do it the right way. Ultimately, I emailed customer service, and the next time we logged in he was able to take the test. As a result, the program was tailored to right where he needed to be-which was no where near what I thought! Placement tests, they're important people! Like I said before, Princess J was easy to start. I wanted her to work from the beginning. I love how easy it is to login, and how easily I am able to navigate through the website. It's super easy to start Princess J on hers, and then when she's finished I can easily switch over to Mr. B without having to login again. It's GREAT! The Toddler area is made up of a lot of fun little video clips and songs. There's even a crafty choice! Princess J spent a lot of time there on her own. At age 4, she's in the age range for both Reading Eggs Junior and Reading Eggs. There are alllllllllll kinds of little videos. I'm not sure what it was about this one, but Princess J LOVES it. She will play it over, and over, and over again. And of course, there's the A-B-C song. Who can resist?! She plays this, then sings it back, then plays it again. It's great that we can access stuff from the iPad. She can just tap what she wants, and I don't have to be right with her helping her with the computer mouse. I kind of love the world. It's really cute. She likes to watch the blimp fly by. It's also great for exploring and discovery. There's honestly so much stuff here for little ones, that I can't even begin to cover it all because we've not even experienced it all yet! Just today we discovered a NEW thing! That new thing is this area haha. The Eggles. And if you swipe down on that cloud, it rains! Cause and effect in action for the win! And that little egg in the bottom corner, takes you to some alphabet fun! And the rainbow egg? Even more fun! Every level has a "Log Out" button that you click on that takes you back to the parent dashboard. Toddler/pre-K fingers can click on things by accident. So, they have put in this little safeguard that makes sure it's the grown up trying to log out. Pretty clever, right? I sat with her during the Reading Eggs levels. I wanted to make sure she was able to work through the lessons, and she sometimes needs some gentle reminders to stay on task. Like Mr. B's Reading Eggspress levels, there's a fun map with visual cues where to go. Having the same format helps Princess J feel like a big kid, like her big brother. Each lesson activity address the same overall letter sound, but each activity presents it in a different way. This is great for autism because often times, kids on the spectrum are SO concrete that something like the color green is only green in one room or in one situation. This program teaches that the concept the same across the board. Here's lesson one. We start by meeting this cute little guy. He will instruct your child to "click the MMMMM" So he makes the sound instead of always saying the letter. This is how I taught Mr. B letter sounds. He would ask me how to spell something, and I would spell it using the letter sounds instead of the letter name. At the beginning the character explains that the letter M says mmmm like mouse. So each time you click on the M, it turns into a mouse! Then the activity changes, and your child as to choose the letter from a selection. After that, your child has to choose from some pictures. This can be difficult for kids on the spectrum, but a GREAT took for therapy. This is my favorite part. They have to find the mmmm sound within a word! I mentioned how easy it is to switch between students. It's really convenient, and their progress is displayed on the front page. I like that I can easily see how both are doing, and keep track of it all for record keeping. This is great for Mr. B's end of the year review, and it's a good way for me to show Princess J's mom and dad (she's Mr. B's sister by his dad) what she's doing when I have her here. Mr. B LOVES this program so much, he said it was one of his favorite subjects now, when just a few weeks ago he would resort to tears when it came to reading. There's a LOT to this program. We just started playing in the Trophy Room, the Arcade, AND we've just discovered the Apartment and the Mall. Mr. B is having fun choosing how to spend his earned eggs. You see, when they complete a task, they earn eggs. Those eggs are then spent in the mall. In other words, the program has a built in positive reward system that will encourage successful completion. The Maps are a lot of fun, and become more interactive depending on how much you finish. It's great that there's a pathway to follow. Mr. B always knows what lesson to do. This is a good visual for kids on the spectrum who do better with visual cues and charts. The lessons are pretty straight forward. You start off analyzing the cover of a book. This can be VERY difficult for Mr. B. He doesn't always do well with abstract concepts, and this can be an abstract type of question. It forces him to look at the picture, including the details-the title, etc, and form an opinion. This can be pretty difficult stuff for someone with autism. Mr. B works his way down the tasks. Each tab has a different type of activity. For example, the Dictionary has the student choose a couple of words to learn. Then they must remember the part of speech, use it in a sentence, and put it in alphabetical order. I love the included poems. Poetry isn't something we've REALLY worked with in terms of comprehension and analysis. This program does a great job at both. The lessons are colorful and interactive, but not overly distracting. It was a little difficult for a few minutes when we were reading the haiku at the end of one lesson, and I couldn't figure out that we could move the question window and turn the pages. That's all part of the initial learning curve when it comes to any new program. You may need to use it a couple of times before you get the hang of it. At the end of each major lesson, your child can choose a reward collector card. Worldspan is his favorite door to choose. I like how there's a tid bit of extra learning included with these cards. Being able to choose a card at the end is a huge motivator for him. He loves reading about it, and sometimes it spurs more curiosity within him, and he goes off to research whatever is on the card. Overall, I wish my review could do Reading Eggs justice, but it just can't. I highly suggest you sign up for the 4-week trial. I've never before found a comprehensive program that can work for Mr. B, as well as his 4 year old sister, this great for us. There's so much here, and so much to learn from by just exploring. The Bonus Section on the parent dashboard offers additional resources. You can print off worksheets that correspond with the lessons and also lesson guides for some grades. I would LOVE to see additional lesson guides for the upper grades! I love the included reward system that is in place, and I love how I can see Mr. B and his sister both learning from this every time they use it. Mr. B will beg me to do his reading now, when before he'd do anything and everything he could to negotiate out of it. There's so much more included that we haven't even gotten to yet-Like Mathseeds! I definitely recommend this to others, and I will definitely be keeping this one around for a long time! Does Reading Eggs Pass My 4 Ingredient Test? I highly recommend the placement test! Do it FIRST! Mr. B wasn't very happy the first couple of days because I had him on the wrong level. Once I figured it out, and it was my mistake totally, he has LOVED it! You must work through the lessons, but you can take a break as needed. Just remember, you are under the limitations of a subscription. You can add additional students, and each additional student is at a reduced subscription rate. It's not boring at all! Each mini lesson is pretty short, and it's all multi-sensory and interactive so it's perfect for ADHD. It can be a little flashy, but Mr. B has had no issues at all. He absolutely loves it. This is mainly reading, though you will find vocabulary work, as well as some tid bits of other subjects in the rewards cards, as well as the reading material. Under the Bonus Material tab, you can pull up some guides that will provide you a list of what topics go with what subjects. Please check out the Homeschool Review crew to read other reviews!